An Turkish opposition MP was today suddenly and unexpectedly jailed after being found guilty of espionage and revealing state secrets. On the face of it, the conviction of Enis Berberoğlu is not a surprise: he joins around a dozen members of the Turkish parliament serving time in behind bars, some of them for more than seven months. But he is the first member of the main opposition party, the CHP, to be sentenced. Put another way, it’s the first time it isn’t an MP from the pro-Kurdish HDP. And few expected his case to be separated from two journalists who are his co-defendants or for a verdict to be handed so quickly. Mr Berberoğlu is more of a journalist than a politician. He was elected as a CHP MP only two years ago; before that, he had a long career working for some prominent titles – including five years as editor of Hürriyet, which is essentially Turkey’s paper of record. 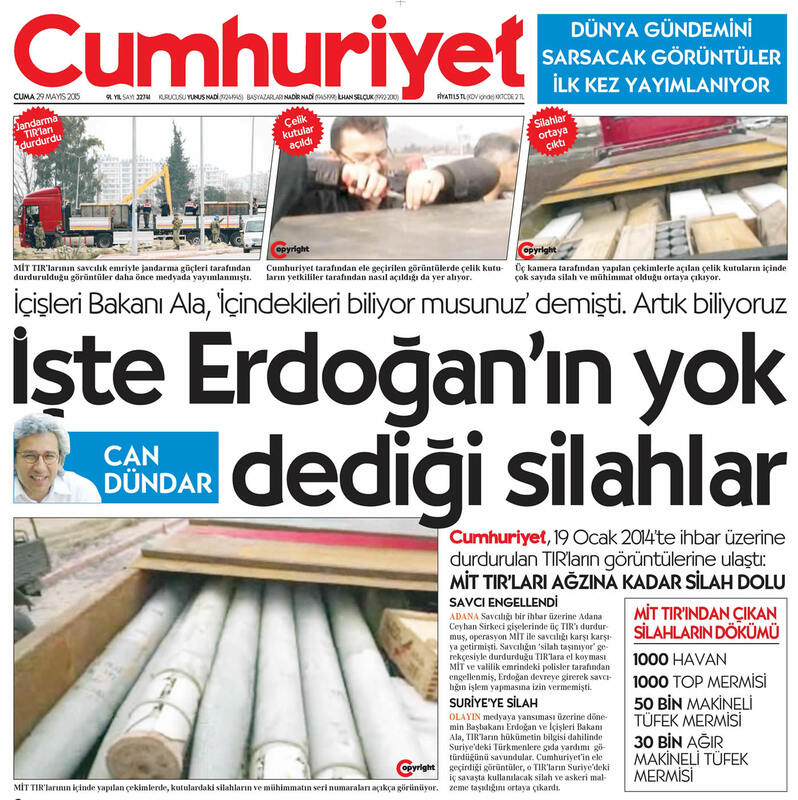 The case against him began two years ago, when opposition newspaper Cumhuriyet published images and footage showing weapons allegedly being smuggled into Syria from Turkey. The weapons were reported to belong to MIT, the Turkish intelligence agency, and were exposed after the lorries carrying them were stopped by prosecutors acting on a tip-off. The images, which dated from January 2014, appeared to demonstrate Turkey was far more involved in the Syrian civil war than it was publicly admitting at the time. That, in essence, is all we know for sure. It was a simply sensational story, but there has been precious little opportunity to develop it further because the Turkish government has aggressively pursued Can Dündar and Erdem Gül, the journalists who published it. It was alleged Mr Berberoğlu himself leaked the material to the Cumhuriyet duo. The individual cases against them were merged into one last year, as is fairly common in Turkish judicial procedure. But today, in an unusual move, their cases were separated once again. Enis Berberoğlu was swiftly handed a sentence of life imprisonment, reduced to 25 years for mitigating factors, while Erdem Gül and Can Dündar’s combined cases will continue to be heard at a yet-to-be-determined date. Mr Dündar is now in exile abroad; Mr Gül was standing trial alongside Mr Berberoğlu this afternoon. All face charges of espionage and revealing state secrets. CHP MPs prompted walked out of the Turkish parliament’s main debating chamber as news of Mr Berberoğlu’s conviction filtered through. They went to a meeting of the parliamentary party that lasted more than two hours. 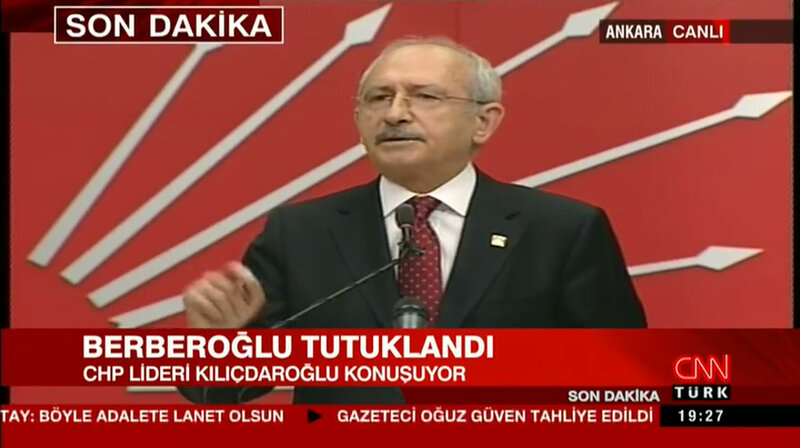 It was followed by a public statement by party leader Kemal Kılıçdaroğlu that lasted all of three minutes. Mr Berberoğlu had been jailed for 25 years without any evidence, Mr Kılıçdaroğlu said. “We absolutely do not accept this decision,” he told reporters on Wednesday evening. Turkey’s judges, Mr Kılıçdaroğlu went on to say, were not operating independently and were simply awaiting orders from the presidential palace. It’s worth remembering Mr Berberoğlu was put on trial because his immunity from prosecution as an MP had been waived in a parliamentary vote supported by the CHP – a vote that also resulted in dozens of HDP MPs facing criminal charges. There were rumours flying around that the CHP’s walkout from parliament could become a permanent form of protest and that Mr Kılıçdaroğlu was preparing to announce a period of disruptive, disobedient behaviour. All he said was that he would standing in Ankara’s Güvenpark, a green space in the centre of the city opposite the Ministry of Justice, at 11am tomorrow morning. He will be holding a banner bearing just one word, Adalet, meaning justice. Reports published afterwards suggested the protest would then become a march from Ankara to Istanbul, a 426 kilometre walk, but the CHP leader did not say this. Senior CHP figure Gürsel Tekin was on CNN Turk later in the evening to confirm his party would be launching nightly “democracy protests” in all 81 of Turkey’s provinces. But as a form of protest, it seems fairly meek. Whether Mr Kılıçdaroğlu has further plans up his sleeve remains to be seen.